Written by: Priya Potapragada on May 30, 2017. Exercise. Healthy-living. Team-building. Dedication. Goal-setting. Confidence. Being physically active is proven to benefit all individuals, regardless of age. However, the necessity for youth and adolescents to participate in physical activity to nurture their social and physical development cannot be understated. It may come as a shock, then, in an age saturated by fads in exercise, new ways to track our fitness, and the growing global popularity of sports, that there are segments of our society in the United States and around the world whose children are missing out on such an essential part of a healthy childhood simply because of a lack of access. It is in our own backyard that we see some of the greatest disparities in terms of health and physical education – particularly with Native American youth. With nearly a quarter of the 5.2 million Native Americans in the U.S. living on reservations, access to proper facilities and equipment, sporting and otherwise, is notoriously scarce. This lack of access has perpetuated an overall decrease in life expectancy and the general rise of avoidable health issues for Native Americans living on reservations. Nike’s N7 Fund – which is part of its Global Community Impact work – was created in 2009 to provide grants to Native American and Aboriginal organizations providing positive experiences in sport and physical activity to Native youth. Committed to providing access to and enabling participation in sport among Native American and Aboriginal youth in the United States and Canada, the multinational sports titan has emerged as a true leader in helping to reverse physical inactivity within this marginalized group. To date, the N7 Fund has awarded more than $4 million in grants to 185 communities, schools and nonprofit organizations across the U.S. and Canada, reaching more than 400,000 youth. Organizations that support Native American and Aboriginal communities through sport and physical activity programming for youth can apply for an N7 Fund grant and receive funding as part of a brilliant initiative to help kids realize their full potential through the power of sport and movement-based activities. Through the N7 Fund, which is administered by CAF America, Capacity Builders Inc. in New Mexico and Camp Thunderbird South Dakota – were able to utilize funding from N7 to put together programs designed to introduce participants to a variety of sports and physical activities which many had never tried before, simultaneously instilling a sense of self and fostering a culture of team-building and togetherness. Capacity Builders Inc. arranged a comprehensive series of tennis lessons for a group of 25-35 Navajo youth, most of whom had never played the game before. Each student was provided a pair of Nike tennis shoes and a series of lessons in the fundamentals of tennis, taught by indigenous instructor Darrah Blackwater. Participants were then invited to use their newly-learned skills to engage with their family and peers in a round-robin style tournament. Furthermore, Capacity Builders was able to purchase healthy snacks for the group and provide lessons in nutrition throughout the duration of the project. 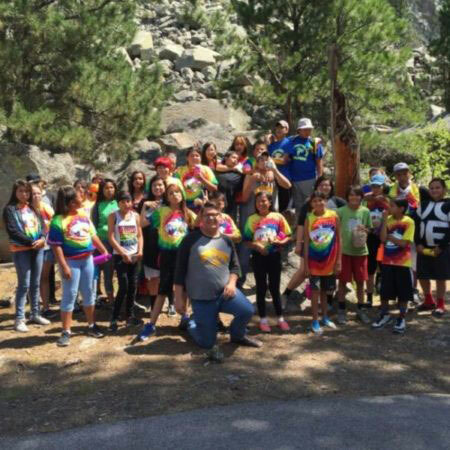 Camp Thunderbird applied the funds to a series of activities and excursions for 63 Lakota youth participants, including a maze challenge, a hike up “Devils Tower” (steeped in Lakota legend), outdoor water activities, a camping trip, and an overnight trip to Black Hills State University – giving kids the opportunity to speak to fellow Native college students and experience student life. Funds from Nike donated through CAF America for both N7 Fund grants totaled $12,000 and were used to hire instructors, purchase equipment and supplies, and provide general funding for both programs. Giving indigenous youth the opportunity to participate in such activities is imperative to the effort to bring inclusion to a group that has found itself on the fringes of mainstream society. However, it also speaks to a much greater problem for the community at large. Lack of infrastructure, funds and development on sprawling reservations across North America has acted as an incubator for myriad problems for Native American and indigenous people – culminating in a range of health & social problems which plague tribal communities, including high suicide, obesity and alcoholism rates. Initiatives such as Nike’s N7 Fund are spearheading the movement to bring greater resources to such a culturally rich & diverse group, while at the same time staying true to its core value of preserving indigenous culture. The N7 organization, which leads the growth of the N7 collection and relationships with tribal communities and urban Indian centers aross North America, has taken care to retain its Native American leadership since its inception in 2000, with founder Sam McCracken and a team of “N7 Champions” dedicated to balancing the fine line of bringing outside resources to a demographic in need, while maintaining the community’s unique sense of identity and tribal sovereignty. In addition, N7 boasts an impressive roster of “N7 Ambassadors” – professional Native athletes who act as representatives and inspirational figureheads for the initiative. Nike also partners with CAF America on other meaningful (outstanding) initiatives, such as the Community Impact Fund.